MF402 cross-faders / chasers are 4-circuit solid-state lighting animation controllers available in different models for driving 12, 24, 120, or 220 VAC or 6-24 VDC loads ( PWM LED dimming applications ). They are ideal for limited budget applications requiring sophisticated fade, auto dimming, color-mixing sequences. In addition to the "Single-Lamp Fade", 1 Dimmer-On/ 3 dimmers-Off combination, they offer another 14 cross-fade combinations to select from with an automatic pattern scrolling mode. The Speed Rate and Pattern Selectors are easily accessible from the front panel. MF cross-faders are very compact in size and can be installed inside standard NEMA boxes. Great for displays and sign lighting controls. The MF402-24VDC is competitively priced and will provide years of trouble-free operation. The line-voltage models are capable of driving incandescent, cold-cathode neon, and magnetic step-down transformers. The DC Voltage units are excellent controllers for the now affordable and popular LED lighting displays and for color Mixing by dimming RGB L.E.D.s. MF405-24DC cross-faders / chasers are 4-circuit solid-state lighting animation controllers with an operating voltage range from 6 VDC to 24 VDC. ( PWM LED lighting dimming applications ). They are ideal for limited budget applications requiring sophisticated fade, auto dimming,color-mixing sequences. In addition to the industry standard "Single-Lamp Fade", 1 Dimmer-On/ 3 dimmers-Off combination, they offer another 14 cross-fade combinations to select from with an automatic pattern scrolling mode. The Speed Rate and Pattern Selectors are easily accessible from the front panel. MF cross-faders are very compact in size and can be installed inside standard NEMA boxes. The MF405-24DC is competitively priced and will provide years of trouble-free operation. They offer an excellent solution for the now affordable and popular LED displays and for color Mixing by dimming RGB L.E.D.s. 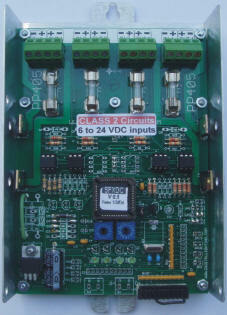 Allow the use of 4 independent Class 2 power supplies. Adjustable Auto Dim , Fade / Chase Rate. Sixteen Fade / chase combinations (Patterns). Selectable light Chase or Fade operation. Warranty Two years limited warranty .